So, Are We Sure About These Tigers Scrimmages? Ever seen this singular photo before? 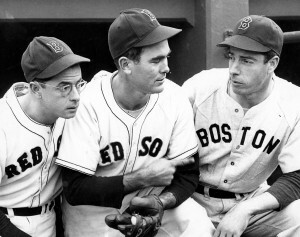 On the left, Red Sox centerfielder Dom DiMaggio. In the center, pitcher Tex Hughson. On the right, in the Sox road gray: Joe DiMaggio – who didn’t have his regular uniform with him for one of the fateful games Boston played 66 years ago. The Detroit Tigers’ idea to address their five day layoff between finishing sweeping the Yankees and facing the Cards or Giants in the Series by playing a pair of exhibition games is not new. The Red Sox did the same thing in 1946. We forget this now, but the Red Sox were prohibitive favorites to win a Series remembered for “Slaughter’s Mad Dash” and the disastrous 5-for-25 performance of Ted Williams. Boston had clinched the American League pennant with a 1-0 win on September 13th (courtesy of a Williams homer, naturally). They won by 12 games over a defending champion Tiger team that nearly played .600 ball, and a tidy 17 over the third place Yankees who imploded and went through three managers. Williams supplied a slash line of 38/123/.342 and had an OPS of 1.164 (and four other guys in the line-up were at .799 or better). The Red Sox were the team to beat. But the National League race was back-and-forth between the Dodgers and Cardinals and with an N.L. first-place tie – and a Series-delaying three-game playoff looming – Sox Manager Joe Cronin and General Manager Eddie Collins thought they needed something to keep their Heroes alert and awake while the N.L. decided which of its teams was going to be its sacrifice to the mighty Boston maw. They scheduled three exhibition games for the Red Sox…versus American League All-Stars. It was a helluva plan – in theory. The Red Sox got such luminaries as Hank Greenberg and Luke Appling and Joe DiMaggio (hence that crazy picture) to travel to Fenway and put the Champs through their paces. They also brought in Mickey Haefner. Haefner had just completed a 14-and-11, 2.85 season for a Washington Senators squad that only the year before had finished a buck-and-a-half behind the A.L. Champion Tigers, so he belonged among the All-Stars doing their part for the greater glory of the American League. But there was only one problem with letting Haefner throw towards your hitters, even in an exhibition setting. On October 1st – which would’ve been the eve of Game 1 of the World Series, had the N.L. only made up its mind in 154 games – Haefner was pitching for the All-Stars against the Red Sox at Fenway. And one of his knucklers – and he threw it in the Niekro/Dickey range of hardness, not the Wakefield range – hit Ted Williams in the elbow. Got him exactly right. There is no idea how hard the pitch was thrown but the pain was sufficiently excruciating to send Williams to the hospital for X-Rays. While those few who saw the injury held their breath (and presumably Collins and Cronin tried to figure out how they could each blame the other), the tests came back negative. That’s the way it was in those days: broken or not broken. Nothing about deep bone bruises or inflamed ligaments or anything else. It hurt? It ain’t broken. Put some ice on it and play. Williams played. 5-for-25, .200. It would be decades before Ted acknowledged that the elbow pain never really subsided through the subsequent Series. The only post-season appearance of his career produced five measly singles. And when reporters concluded Williams had not risen to the occasion, or had been psyched out by what was even then a rare but not unique infield defensive shift, Williams let them blame him. Despite the apparent justification for such a claim, he never blamed his ’46 World Series nightmare on the Haefner Hit-By-Pitch. That the Sox lost the Series was not the end of the story. The pall of that loss lingered for generations. Boston would slide into the second division, then the basement, and would not emerge until the year after Williams was inducted into the Hall of Fame. That his performance in the 1946 Classic was the low point of Williams’ career goes without saying. He eventually admitted it was the low point of his life. Talk about the Curse of the Bambino? Bolshoi! The Curse of Mickey Haefner, more like! If you check history – especially internet history – you might see passing mention that Williams hurt his elbow when hit by a pitch “in an exhibition game just before the World Series.” But what you do not see is the disturbing truth that is of particular relevance tonight: Williams hurt his elbow when hit by a pitch in an exhibition game just before the World Series that had been arranged by his own bosses to try to keep the Red Sox sharp FOR THE WORLD SERIES. Today, of course, Collins or Cronin would’ve been fired or at minimum vilified by history for their gross stupidity. Didn’t happen that way. Cronin succeeded Collins as General Manager, then became American League President in 1959. Both of them are in the Hall of Fame and Cronin has his retired number 4 right up there with Teddy Ballgame’s. The Tigers are not asking any of their vanquished foes to help them fill the competition gap by playing these exhibitions (the term they used was “scrimmages”) on Sunday and Monday. They have flown up the minor league kids like pitchers Hudson Randall and Joe Rogers from the Florida Fall Instructional League to fill the role played by the A.L. All-Stars in the last ill-fated attempt to keep the rust from growing while the National League tries to figure out its champion (Cards or somebody else). Presumably the Tigers will take every precaution against the obvious things: sliding (no! ), diving for fly balls (don’t! ), line drives back at pitchers (use the Batting Practice screen!). But unless Jim Leyland and Dave Dombrowski are aware of the 1946 Red Sox disaster and the saga of Mickey Haefner, they cannot possibly be prepared for the inadvertent pitch that just…gets away. What do they do if Miguel Cabrera gets hit in the elbow? Or the knee? Or the head? Or while at third base takes a one-hopper off his bean, as he did in Spring Training? Hudson Randall and Joe Rogers, you say? Neither of them is a knuckleball pitcher, right? It will be one of those freaks of baseball nature, not unlike the year the St. Louis Browns won the pennant because all their players were just physically bad enough to not be drafted for World War 2, or the year the Reds won the most games in the National League yet did not make the playoffs. The Detroit Tigers, with probably the worst defensive starting line-up in the majors today – and one of the worst of all-time among serious contenders – will likely blow through the American League Central and could easily start the playoffs as the odds-on favorite to win the ALCS and even The Series. — Ryan Rayburn at second: You need to see the video again of him doing the Jai-Alai bit in left field to send Miguel Olivo’s fly ball over the fence? Here’s the link. — Jhonny Peralta at short: This is an ex-shortstop turned third baseman and reconverted to short. And he’s the infield stalwart. — Miguel Cabrera at third: No. — Delmon Young in left: This will make you hanker for Raburn. — Brennan Boesch in right: Immobile. — Alex Avila catching: He’s a gifted receiver but, without Victor Martinez to help him out, the temptation for Jim Leyland to play him 133 more times behind the plate will be huge. His exhaustion down the stretch last year was ultimately disastrous. You’ll notice I left out Austin Jackson. Obviously he is one of the best centerfielders in the game, not just fast but instinctive on balls off the bat, and in his throwing. But between Young and Boesch (or any of the alternatives) in that of all ballparks, they are asking him to cover a lot of ground. But of course this is academic. When Salvador Perez and Joakim Soria went down, they postponed any chance of a KANSAS CITY uprising until next season. The Royals needed everything to break their way to offer a serious challenge, and we already know it won’t. They can live without Soria but pulling either Greg Holland or Jonathan Broxton out of their set-up pool will wind up overburdening the rotation. I still think the Royals could manage a second-place finish, but it’ll be distant behind a Tiger offense and pitching staff that are each 50% better than anything else in the division. CLEVELAND is beginning to understand that if Ubaldo Jimenez did not hit his high water mark at the 2010 All-Star Game, he did so in the “Zander?” commercial with Jorge De La Ros about the bicycle license plates. How they could not see that he had lost command and speed suggests the Indians need to sign up for cable or a dish. That he cost them Drew Pomeranz and Alex White may come to haunt the Indians the way the Mike Napoli deal haunts the Angels. Manny Acta will get everything out of this team, but exactly who is going to make the decision to pull Jimenez out of the rotation? Sometimes rebuilds can be fun. Consider the rookies and sophomores in CHICAGO: closer-in-waiting Addison Reed, relievers Hector Santiago and Nate Jones, third baseamn Brent Morel, rightfielder (well, hitter in right field) Dayan Viciedo, and, the most intriguing prospect of them all, Manager Robin Ventura. The White Sox will struggle to see .500 but Ventura’s extraordinary equanimity, devious humor, and quiet command will set a tone for quick recovery. Whether the White Sox have enough coming up through the pipeline to make them contenders in the near term is another thing all together. Before you cast stones at MINNESOTA – be honest. Did you cry “no” when they gave then-recent-MVP Justin Morneau the big money? Did you say it was ludicrous when they gave Joe Mauer his $184,000,000 or did you extol the virtues of the small market team that could somehow afford to keep its hometown hero? You didn’t warn, I didn’t, the fans didn’t, and Twins ownership didn’t. And now we’re all on a possibly-irreversible trip to an AL Central version of the current events in Houston or Pittsburgh: exquisite new ballpark, faithful fans, and a team that can’t even afford to retain a Delmon Young during a season or a rehabbed Joe Nathan following it. It’s grim and it’s a reminder that Cincinnati is one blown-out kneecap away from having to give 51% of the franchise ownership to a suddenly-retired Joey Votto in lieu of paying a suddenly-retired Joey Votto. Tigers, with or without a Statuary Defense, should win this division by double digits. The Royals and Indians will fight for second (and fight to stay over .500) and the White Sox will likely come in a few notches under. The Twins may be bad enough for the team to have to put up twelve-foot high fences to keep their most loyal fans from throwing themselves into the Fire Pits at Target Field. The latest weather forecast here in soggy New York suggests nothing worse than showers for Saturday night’s resumption of Game One of the American League Division Series between the Tigers and Yankees. Of course, that’s what they said Friday night as well, and the “showers” turned into rain so hard that it was literally bouncing back up off the seats and even the field at Yankee Stadium. From what I can tell, the four key parties – the Yanks, the Tigers, TBS, and MLB – all had forecasts suggesting any rain could be played through (if they hadn’t, you would have expected Jim Leyland and maybe even Joe Girardi to switch starters and hold back their aces – maybe starting relievers with starting experience like Phil Coke – in anticipation of the deluge). In any event, just in case the game is again delayed until Sunday, MLB is reportedly prepared to play a day-night doubleheader, which is already being portrayed as an all-time historical first. Technically it wouldn’t be. 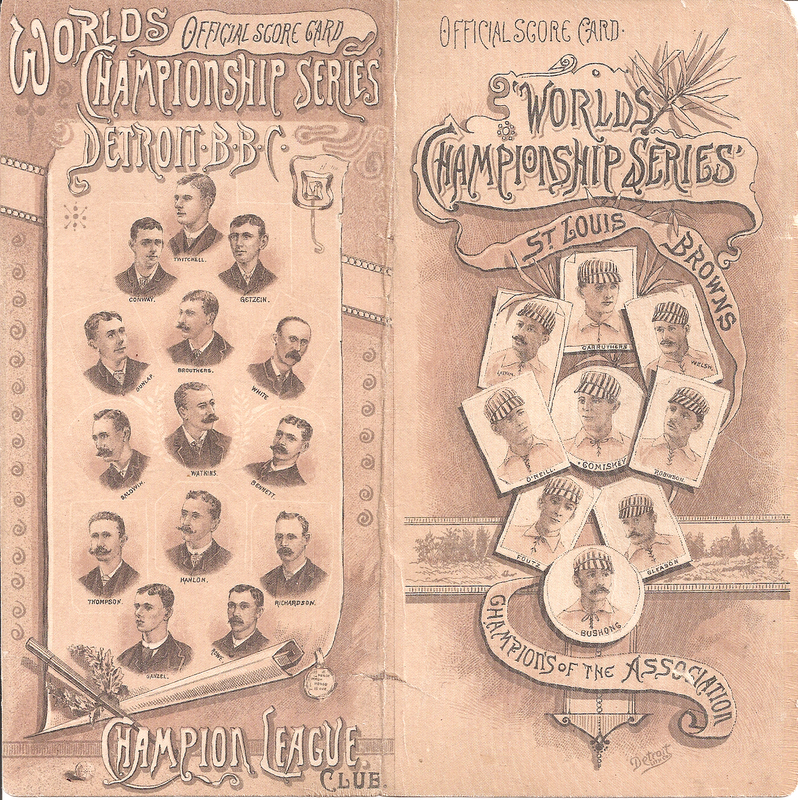 Back in the 19th Century when major league baseball (then comprised of the National League and its junior rival, the American Association) was still experimenting with the idea of post-season championships, their champions played a 15-game “World’s Championship Series” with stops in a mind-boggling ten different cities. Sure enough, on Thursday, October 20, 1887, the NL Champion Detroit Wolverines and the AA-winning St. Louis Browns were scheduled to play a World’s Series game in Washington. They were rained out. So instead, on the 21st, they met up in a game that started at some point in the morning, and then the two teams traveled by train to play in Baltimore the same afternoon. It’s the only time the same two teams have played two post-season games in the same day, and on top of the bizarre concept, the afternoon game, played at Baltimore’s Union Park, cinched the Series for Detroit. The Wolverines, on a four-hitter by starter Lady Baldwin and a two-run homer by Larry Twitchell, pounded St. Louis 13-3 to win Game 11 and take an 8-to-3 lead in the best-of-15. The concept of ending the series once it was mathematically impossible for the other team to win was not yet locked in place, so the teams got back on the train and played Game 12 anyway the next day in Brooklyn. In fact they played the series right to the end as scheduled, with a game each in Detroit, Chicago, and St. Louis. Attendance was what you’d expect: they drew 378 fans in Chicago for the meaningless Game 14, and just 659 for Game 15 as St. Louis fans came out to watch their team which had already lost the Series! When I first mentioned on Twitter that there had previously been a post-season doubleheader – in 1887 – I got a lot of guffaws in return. Baseball has pretty much erased the pre-1903 history of post-season championships. But as the scorecard shows, it was called “The World’s Championship Series” and it pitted the teams that had won the pennant races in each of the two major leagues. It may have been far from a final product, but to my mind it — and the ones that preceded it in 1884, 1885, and 1886, plus the ones in 1888, 1889, and 1890 — count (although the weather turned so bad, and the fans so disinterested, that they abandoned the 1890 series with Brooklyn and Louisville tied at two wins apiece). So if the Tigers wind up playing a post-season split doubleheader on Sunday, not only won’t it be the first such event in baseball history, it won’t even be the first such event in Detroit baseball history. Seriously? What were they going to do to us? Make us go sit outside? Cancel the game on us? Tape over our mouths? Screw up ticket distribution by turning the scheduled start of Game 2 into the resumption time of Game 1? Was Bud Selig going to slap everybody for innuendo-mongering? I think they were just trying to sell one more round of drinks. The suspension announcement came about five minutes later. 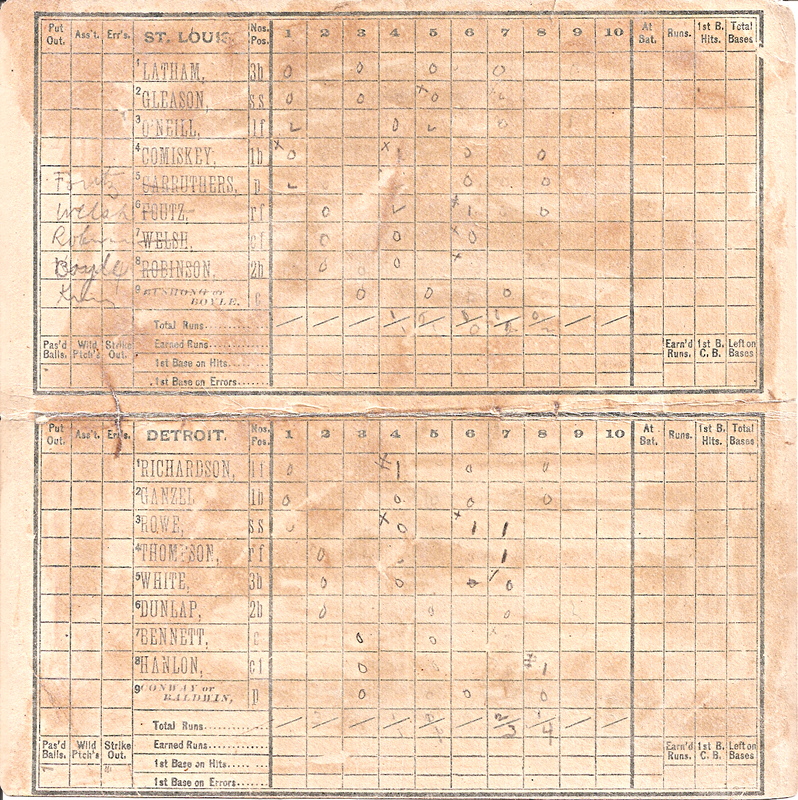 Interior of the scorecard, obviously long glued in a scrapbook. Near as I can tell, this is from Game 9 in Philadelphia, won by Detroit 4-2 on a tiebreaking single in the 7th from Charlie Bennett, for whom Detroit's stadium would later be named. Early games of the Series drew more than 6,000 fans, but by the time of this one in Philadelphia on October 19, fatigue was setting in and only 2,389 showed. The Doubleheader would be played two days later. Chicago: There are a lot of good players on this team. In fact, in a remarkable evenness ranging all the way from the bullpen to the outfield, the average White Sox player is above-average or better. Just – with the exception of Adam Dunn and Paul Konerko – not very much better. There are two men, coincidentally the team’s doubleplay combination of Gordon Beckham and Alexei Ramirez, who are on the verge of stardom. If they achieve it, if they take the cliched next step, the White Sox can compete in the division. If not, this is a team that is indeed just above-average, and bound for nothing better than second place. Cleveland: Three unheralded stars (Carlos Santana, Shin-Soo Choo, Chris Perez), the very good Asdrubal Cabrera, and filler. Quite awhile ago the Indians stopped taking competing seriously. The ’90s saw the Kenny Loftons et al locked up early and often (in the model since successfully copied in Tampa), but the ’00s saw ownership refuse to spend the money early enough to keep the Cliff Lees and CC Sabathias, and to have clearly also not spent it on careful study of the prospect yields when that talent had to be moved (quick: who besides Matt LaPorta did they get for Sabathia? Who did they get for Lee? And it’s not enough to say, ‘yeah but they got Santana, Choo, and Perez for almost nothing’ – Lee and Sabathia should have produced at least two blossoming stars each). And this decade seems to be the time of refusing to promote prospects when the season was still fresh and up for grabs. Even when placeholder Jason Donald went down with injury, the Tribe refused to promote third base stud Lonnie Chisenhall. And an approach like that gets you not just mediocrity now, but mediocrity later – when Chisenhall leaves anyway, by trade or free agency. The answers, by the way? Sabathia produced LaPorta, Matt Jackson, Rob Bryson, and Michael Brantley. For Lee it was Donald, Carlos Carrasco, Jason Knapp, and Lou Marson. Not acceptable. Detroit: The Tigers should have as much pitching as they have confidence. Brad Penny is the Number Two Starter? Brad Penny, who had a 5.61 ERA in his 24 starts in the AL in 2009? One also has to doubt Phil Coke’s ability to return to starting (the Yankees traded him because lefty hitters – especially those who saw him more than once – seemed to solve him), and there is the continuing non-afterglow of Rick Porcello. Justin Verlander and Max Scherzer are studs, but Penny’s placement at #2 implies some lack of confidence in Scherzer, who might still be one of baseball’s best starters. There is also a certain creakiness here: Carlos Guillen is hurt, Magglio Ordonez is a question mark, and the major investment in the off-season was in a catcher who cannot catch: Victor Martinez. I am not excited by the Tigers and in the first two games in New York there was a certain sloppiness to their play in the field – particularly by shortstop Jhonny Peralta and sub second baseman Will Rhymes – that must have Jim Leyland ready to break up the furniture. Kansas City: If lightning were to strike and present the Royals with some kind of Cup-A-Soup Five-Pack of instant starters, they might actually be competitive. There is a decent infield with improvements coming up at the corners by mid-season, and the all ex-prospect outfield of Alex Gordon, Melky Cabrera, and Jeff Francoeur. But there are no Cup-A-Soup Five-Packs of instant starters (even if Aaron Crow and Mike Montgomery were to step into the rotation tomorrow). Minnesota: The Twins’ main competition in this division is their own health. If Justin Morneau and Joe Nathan do not fully relapse (and a Nathan partial relapse would be neatly covered by Matt Capps) and no other star comes acropper, I don’t see Minnesota being severely tested. The infield is stronger with Danny Valencia at third and the guy I’d bet on as of tonight for ROTY (Tsuyoshi Nishioka) at second, and the rotation deep enough to move the aptly named Kevin Slowey to the bullpen. There is much more of a gap between the Twins and the rest of the division than conventional wisdom suggests. OVERVIEW: 1. Minnesota (in a comparative romp); I’ll go for the Beckham-Ramirez growth spurt to make it 2. Chicago and 3. Detroit. The Royals will put up a valiant fight, but it’s got to be 4. Cleveland and 5. Kansas City. Having picked Tampa Bay to upend the Yankees in the East, we move to the AL Central. confident about assessing CHICAGO than I am about any other team in the majors. easily win the division, but I would hesitate to bet on it. flag, but it is just as plausible that the bullpen will again be its undoing. Charlton. The Reds would trade Myers within a year and Charlton within two. office personnel to pull it off. this division, than I do Chicago. Thus, the Tigers, close, over the White Sox. Milwaukee or maybe even Denver and Tampa.